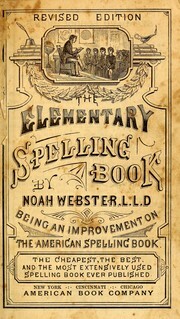 The elementary spelling book: being an improvement on "The American spelling book"
Dissertations on the English language: with notes, historical and critical, : to which is added, by way of appendix, an essay on a reformed mode of spelling, with Dr. Franklin's arguments on that subject. 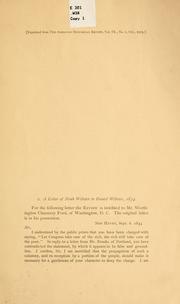 (Circular.) 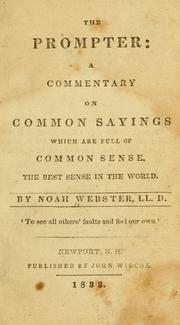 To the physicians of Philadelphia, New-York, Baltimore, Norfolk and Newhaven: Gentlemen, as a malignant fever, has, for three summers past raged in different parts of the United States, and proved fatal to great numbers of our fellow-citizens ... it becomes highly important to take such efficacious steps as human wisdom can devise to prevent the introduction, arrest the progress or mitigate the severity of such a serious calamity. 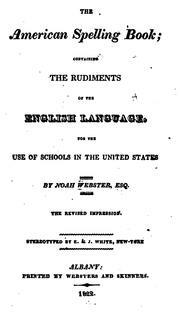 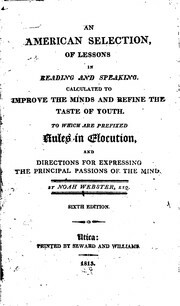 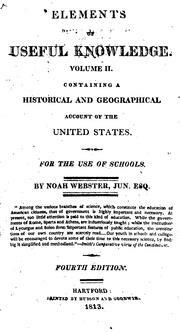 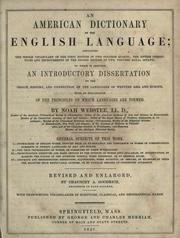 An American Selection of Lessons in Reading and Speaking: Calculated to Improve the Minds and ..
Letter to the governors, instructors and trustees of the universities and other seminaries of learning in the United States on the errors of English grammars: By Noah Webster, Jun. 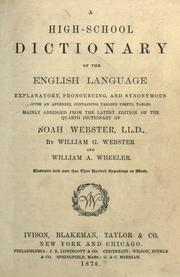 Sir, with a view to collect authentic facts respecting the origin and progress of the public prints in the United States ..
Webster's dictionary of synonyms: a dictionary of discriminated synonyms with antonyms and analogous and contrasted words. 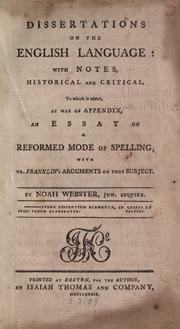 A plain and comprehensive grammar of the English language: being the second part of Mr. Webster's Grammatical institute, with amendments and additions. 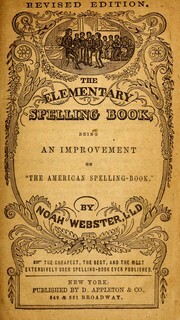 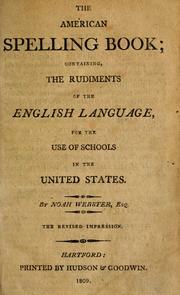 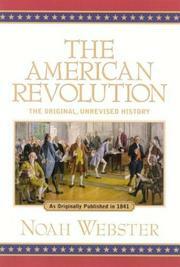 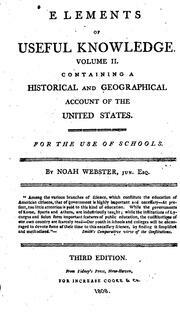 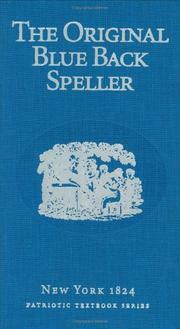 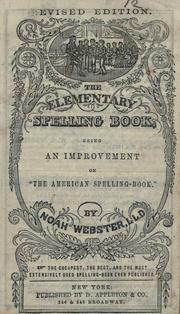 Noah Webster's American spelling book: with an introductory essay by Henry Steele Commager. 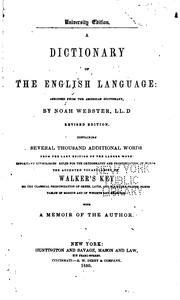 Ten letters to Dr. Joseph Priestly, in answer to his Letters to the inhabitants of Northumberland: From Noah Webster, Jun. 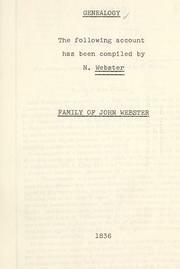 Genealogy: ...family of John Webster. 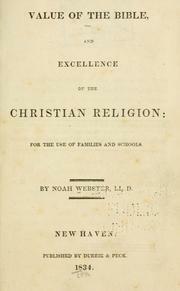 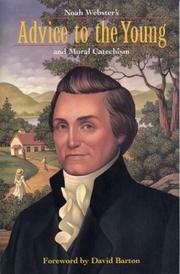 Value of the bible and excellence of the Christian religion: for the use of families and schools / by Noah Webster. 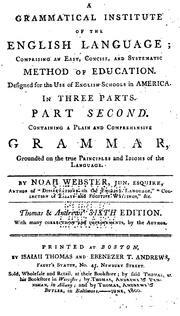 An introduction to English grammar: being an abridgement of the second part of The grammatical institute. 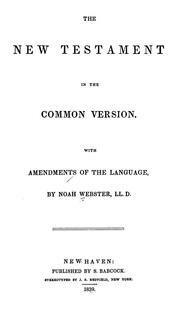 The Holy Bible, Containing the Old and New Testaments, in the Common Version with Amendments of the Language, by Noah Webster, LL. 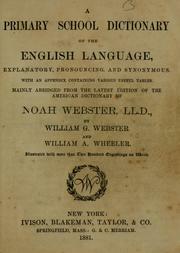 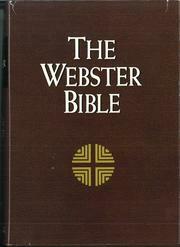 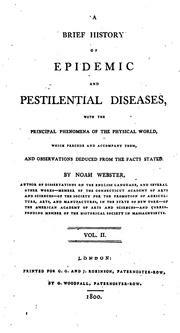  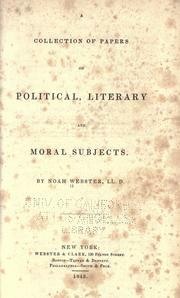 D.
The following is a specimen of the lexicography of Webster's dictionary ..
Letter ..: to Daniel Webster. 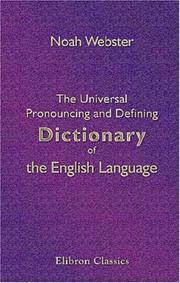 Biographical dictionary: a dictionary of names of noteworthy persons with pronunciations and concise biographies. 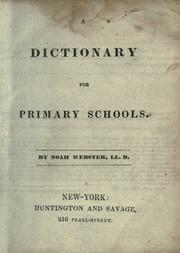 Webster's elementary dictionary: a dictionary for boys and girls. 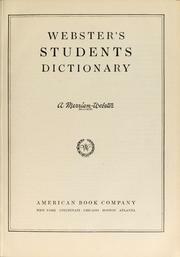 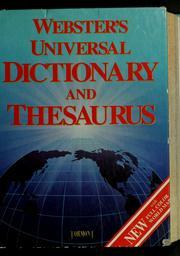 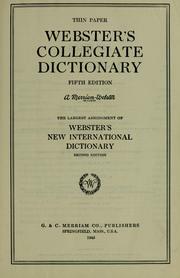 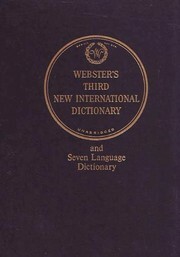 Webster's Students dictionary: A Merriam-Webster. 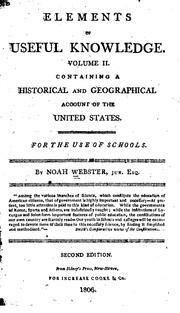 Elements of Useful Knowledge: Volume II : Containing a Historical and Geographical Account of ..
An American Dictionary of the English Language: Exhibiting the Origin ..
History of the United States: to which is prefixed a brief historical .. 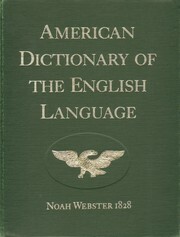 Elements of Useful Knowledge, Vol. 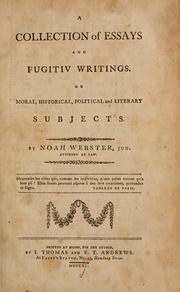 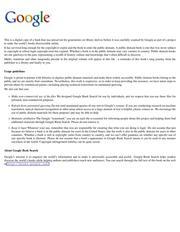 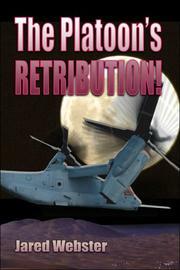  II: Containing a Historical and Geographical Account of the .. 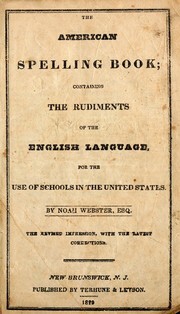 The American Spelling Book: Containing the Rudiments of the English Language, for the Use of ..
A Grammatical Institute of the English Language: Comprising an Easy, Concise, and Systematic ..
A Grammatical Institute of the English Language: Comprising a Easy, Concise, and Systematic ..
A Brief History of Epidemic and Pestilential Diseases: With the Principal Phenomena of the ..
Are you sure you want to remove Noah Webster from your list?